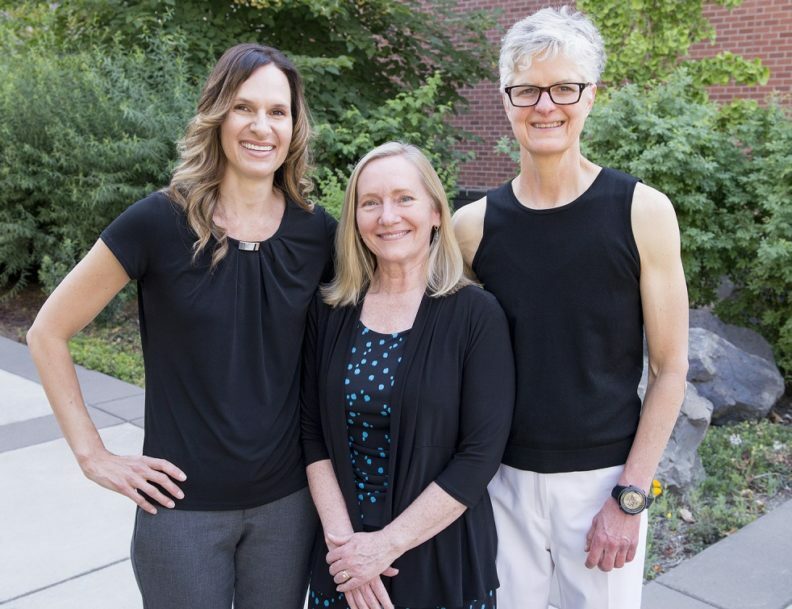 Left to right, Associate Professor Michele Shaw, Assistant Professor Marian Wilson, and Research Associate Mary Lee Roberts studied why people who have chronic pain sometimes move from appropriate use of opioids to addiction. Photo by Cori Kogan. How do people with chronic pain move from appropriate use of opioids to addiction? And what prompts them to seek addiction treatment? As the United States grapples with rising opioid addiction and overdose death rates, the answers to those questions are critical. Yet they’re not well understood. Three researchers at the Washington State University College of Nursing – Assistant Professor Marian Wilson, Associate Professor Michele R. Shaw, and Research Associate Mary Lee A. Roberts – studied those transitions and published their findings in the journal Nursing Research. The researchers interviewed 10 adults in the Spokane area diagnosed with chronic pain who were receiving outpatient medication-assisted treatment for opioid addiction (more formally referred to as “opioid use disorder” within the medical field). In most cases, the study participants began using opioids via a legitimate prescription for pain caused by injury in an accident, or for a medical condition such as infection, childbirth or a birth defect. Two participants reported that they began taking illegal opioids to self-medicate their pain. The study participants unanimously agreed that they did not receive much information regarding non-opioid therapies to help ease their pain. Some reported being surprised by the high dose of opioids they received for relatively minor pain conditions. Eventually, the subjects reached a point where they wanted to return to a more “normal” life. Often the subjects made several failed attempts at stopping opioids before entering medication-assisted treatment — an outpatient clinic where daily opioids, such as methadone, were prescribed to curb their drug cravings. The study participants relayed that in many cases, their healthcare providers had opportunities to help them identify their addiction and successfully transition into treatment. However, most participants said they felt judged by healthcare providers, who didn’t believe their medical complaints or didn’t take their pain complaints seriously. The study findings indicate that nurses and other healthcare workers can play an important role in addressing the nation’s opioid crisis by providing compassionate, nonjudgmental care.